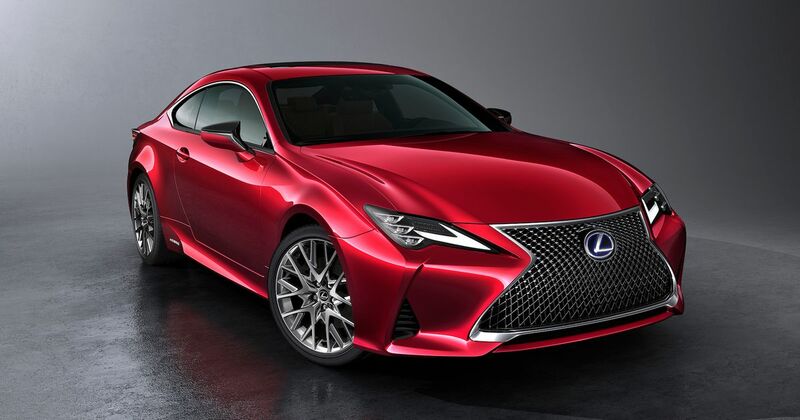 With half the motoring world still busy swooning over the LC, it’s easy to forget about Lexus’ other coupe, the equally striking RC. And now, there’s a new-ish version. It’s been lightly facelifted, with the updated version due to make its public debut at the Paris Motor Show in October. It’s a typically modern (read: extremely subtle) styling refresh, with the most notable changes being at the front. There’s a new bumper with relocated intakes plus new headlights with integrated daytime running lights. It’s the same story at the rear, with new clusters at vents pushed to the edge of the bumper. The mesh structure of the huge trapezoidal grille has been changed too. The idea of all of this? To make the RC look a little more like the LC. There have also been some minor suspension tweaks and aero tweaks, while the 2.0-litre engine option now enjoys better throttle response. The interior changes are just as subtle, with the most noticeable being a new analogue clock, pinched from the LC. Plus ‘Mustard’ and ‘Ochre’ trim colour options, the latter also taken from the LC. We’re sensing a theme here. For the outside meanwhile, there are now 11 different hues to pick from. Fan of high-revving V8 shenanigans? Panic not - a refreshed RC F has been spotted undergoing testing, and its reveal should closely follow the standard RC’s.